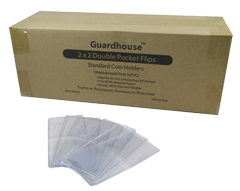 Double pocket unplasticized coin flips provide medium to long term protection for your storing your coin collection. 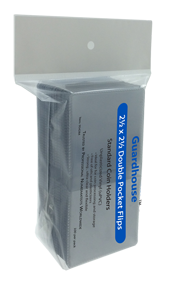 Each flip is 4" x 2" or 5" x 2.5" with a pocket on each end. Simply fold over into a 2" x 2" or 2.5" x 2.5" square. Store a coin in each pocket or put a coin on one side and a separate note on an insert on the opposite side. Sold in 2" x 2" or 2.5" x 2.5" and in packs of 100 or 1,000 pieces. With or without pre-cut paper square inserts.